Epox 9NDA3+ PCSTATS Review - Does Epox = Overclocking? Epox's older socket 754 nForce3-250Gb motherboards were able to reach 290 MHz FSB, so we had some high hopes for the 9NDA3+ before us. The first thing we did was lower the CPU clock multiplier to 8x so the processor would not be the limiting factor. Next we began raising the clock speed of the motherboard slowly. At 213 MHz the motherboard appeared to run into a few memory related issues, but increasing the memory voltage to 2.8V solved these initial problems. Continuing, things went pretty smoothly until 234 MHz. 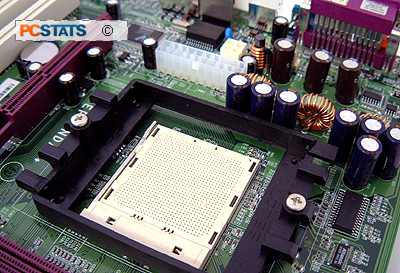 This time we had to increase the NF3 Ultra chipset voltage to 1.75V, and lower the memory frequency by using the 5:4 divider in order to stabilize the overclock. After that, the Epox 9NDA3+ was easily able to pass 250MHz, 260MHz and 270 MHz. In the end, it reached a Front Side Bus overclock of 283 MHz. 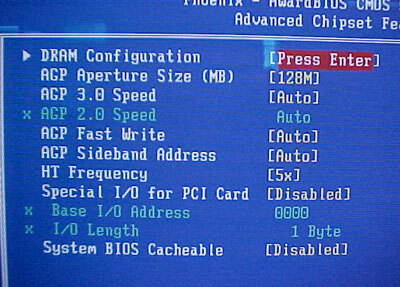 The BIOS has Traditionally been one of Epox's strongest areas. The 9NDA3+ has quite a few AGP options in the Advanced Chipset Features section. These include Aperture Size and AGP speed as well as Fast Write and SBA. 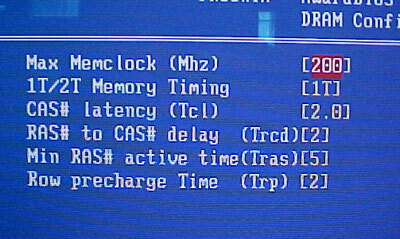 In the DRAM Configuration menu we have the usual memory timing adjustments we've come to expect. 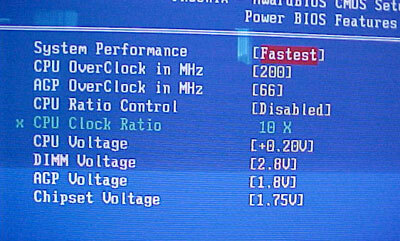 In the Power BIOS section users can adjust the system performance between 'Normal' and 'Fastest.' The FSB can be tuned from 200-400 MHz in 1 MHz increments, while the AGP can also be adjusted in 1 MHz increments from 66 MHz to 100 MHz. The clock multiplier ratio can be adjusted but no 0.5 multipliers can be selected, only whole numbers. Maximum CPU voltage is 0.2V+, DIMM 0.3V+, and AGP 0.3V+. You can also raise the chipset voltage to 1.75V. Up next, the benchmark results! Pg 2. — Does Epox = Overclocking?